Dear Twitterling, welcome to the Twittersphere! *This article conveys opinions of the author, and does not reflect perspectives of the HIMSS organization, the author’s employer or other affiliates. Twitter can be valuable tool for everyone let alone healthcare. The goal of this series of articles is to help you get started and familiarized with Twitter. We shall also discuss how to improve your presence and grow your audience and have a channel that you can promote yourself, your product or your organization on Twitter. 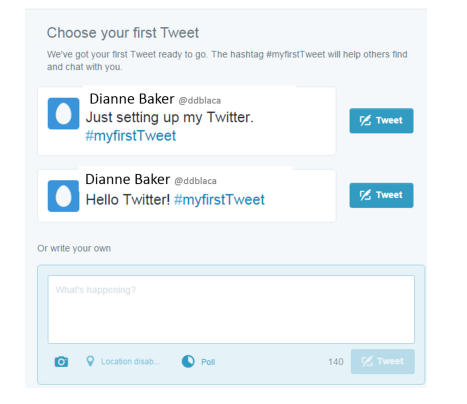 If you haven't set up an account, first, let’s create your Twitter account and get started with Twitter. If you have a Twitter account and you've used Twitter you can skip this section. Go to Twitter.com. This is what it looks like when you go to Twitter (see image below). Let us go to "Twitter.com here." You see where it says "New to Twitter? Sign up." You can login in this area. But, if you want to sign up , so go ahead and enter your information. To sign up you just put in your name. For your email this needs to be a unique email. If you're creating multiple businesses you need a new email for every business. Put in any acceptable password you want. Then, click "sign up for Twitter." And it will take you to a screen to pick a username for you. If it says "username is available, it is yours. You can change it later if you like. Twitter will email you a confirmation. As long as those things on the right are green you're good. Check whether you want it to keep you signed in or not. You might to just leave it on unless you're going back and forth between accounts, if you have multiple Twitter accounts. There is also an option to tailor Twitter based on your recent website visits. By checking this it will give you some tips on people to follow and stuff like that. A Twitter account represents people. And it represents brands. So it could be either of these on Twitter. On Twitter, you can create as many accounts as you want. So long as you're not spamming people or doing anything fishy with your content. So really it doesn't hurt to have more than one Twitter account if you have different purposes or different brands or different personas that you want to represent. So don't be afraid to create more than one Twitter account if you want to. We can click "create my account." And here we go. We are set. It gives a nice little welcome intro. It will show you what a preview tweet is. Click "next." It will show you a little bit about building your timeline. Twitter will also guide you “Here's some people you can follow. It will give you some options TV stars, movie stars, music stars. So once you've found a few people to follow, you can follow @HIMSSSoCal. Let’s search for @HIMSSSoCal. What I would do is right now make sure you're following HIMSSSoCal. Click "follow" on that. Search for anyone else you want here. I mean really you can search for anyone. Let's search for Health Nuts Media (Twitter Handle: @healthnutsmedia ). There we go. Let’s click "follow" there and you are now following Health Nuts Media. Let us click "follow" right there. You could go on and on in following lots of cool people/organizations on twitter. As an exercise try looking up the current ONC, Office of the National Coordinator for Health Information Technology, Karen DeSalvo and see if you can find her on Twitter and follow her. You should be able to see the updates from people you have followed already. It doesn't matter how many people you follow as long as it's interesting and they're people that are related to things that you're interested in. Now that you've got a few good people on your list. Now it should say that you followed enough people. Then, click "next." There are other ways of finding people that you know on Twitter as well. It will ask you to find some people you know. If you want you can just go through there. You can ask research through your contacts on any of these services, Gmail. Yahoo etc. And search for contacts that are using Twitter. Or you can click "skip" down there. Just get through that. It prompts you to upload an image. I do recommend that you do that. If you don't upload an image it'll have this little egg icon on it. Upload an image that allows you to be identifiable to the people who see your post and your timeline. You'll get a lot more re-tweets. You'll get a lot more follows. And your audience will grow a lot faster if you have a real image identifying you or your brand. Something that's identifiable to you that will draw attention to your tweets. In the timeline you can see thing like some brands that you recognize there. Often the close connections and people you recognize are going to be the most interesting things to people that are following you. So you want to find what is based on what your passion is. It is usually about what draws at those heartstrings of the people you see. That applies to your Twitter images well. Your bio is not going to appear in the Twitter stream. So this could really be anything describing you briefly. And click "done" there. That'll take you to the next step that Twitter wants us to do. It wants you to confirm your email. With that, you have just created your first Twitter account. Twitter tries to make it easy and takes you through a few screens. You actually didn't even have to do those last couple steps. If you just hit "skip. Skip. Skip. Skip." You would have been done and your Twitter account would have been created. It's just a matter of filling out your name. Email address. And selecting a Twitter username. And you're basically done. So that's basically it for how to create a simple Twitter account. The posts that you make on Twitter and what you put in them and how you do it can make or break whether you gain followers, whether you get re-tweets and eventually whether your presence grows on Twitter. Twitter can be done via the web or the mobile interface. For example, if you have an iPhone or an android device, an app for Twitter is available for iPhone and android. After you sign up and create an account, Twitter gives you some examples to make a post (see screenshot above) . So creating a post is actually really simple. The main way is just over there in the upper right corner. Click on “Tweet." For instance, you can type "hello world." Or whatever you want to do in your post. If you want to add an image to your tweet just click on the little camera button here. Then just click on the image and select an image that you want to upload with your tweet. If you want to add a location you can add a location. Now let's just hit "tweet" and see what it does. If you are on any other part of twitter, you can actually compose your own tweet via another means by clicking on the icon on the right, with the little feather pen on it. If you click on it, it says "compose new tweet." Click on that. And now you've got a similar screen. You can say, "This is my second post." Remember just a little bit of information. You've got this number (140), Twitter only allows 140 characters or less. So once that hits zero you are at your limit. So if you just type in a bunch of information here till it gets down to zero. You'll see once you get to the negatives it will actually start chopping. It actually doesn't even let you post if you hit below zero. Add an image if you want. Hit "tweet." And now you've posted. It's really that simple. Here are some quick tips on how to make a good post and strategies to use on Twitter and to get acquainted with the language used on Twittersphere. New planet, learn the new language. Strategies: You want to come up with things that drive on people's passion. You can think about your business objectives and what are you trying to achieve. Maybe you want to get more visitors to your website. Maybe you want more sales on your website. Think about what you're trying to achieve. And with that you need to develop strategy on what types of posts will drive those types of things. Think about what will tug at the heartstrings of your followers. Replies: Think about what will get them interested and have to comment or reply or make them re-tweet your post. Keep in mind that anytime someone replies to your posts they're mentioning your account. That shows up as a link on Twitter which drives more people back to your account and builds traffic. Re-tweets: When someone re-tweets you there actually sharing your tweet into their timeline which their followers than see. This will get them to follow and show interest in you. So re-tweets and replies are good. Hashtags (No spaces allowed): Another thing you might want to consider as well is hash tags. So over on the left, you can see trends over here. As you see on the left there are no spaces in that trending term. The trending term will show up in your feed as a link. If you click on link that actually goes back to the main feed for that hashtag/trending term. Use a hashtag for the trending term to post something and you automatically became part of the conversation. By posting using hashtag for a trending term, you can start getting followers immediately. Keep in mind to not spam and to not do things that are not applicable to that particular trending term. People can find that annoying and might stop following you or block you. So don't spam your followers. But, if meaningful, as a part of a strategy, you can use a hash tag. It is one technique to grow followers is add those hash tags that lots of people use. You're basically joining a community/event when you use this hash tag. So you can ask yourself, how can you enter the community with your brand which is among the basics of creating your first post. Hash tags are a great way to grow an audience and participate in a conversation. A hash tag is basically pound sign. And then a unique keyword. That's either one that already exists and people are already using and participating in or you can create one. There is nothing like registering a hashtag. You might want to check and see if people are already using it so your message isn't getting diluted in someone else's conversation. But once you use the #unique name for your conversation with your tweets it'll appear in your stream with a link back to Twitter search for that. Read more about using hashtags for an event here and about #HITCON15. #Engage4Health is another recent hashtag you can use to catch up with the Patient Engagement Summit. Following: When you follow users you are basically deciding that you want their posts to appear in your stream. Favorites: You can actually favorite a tweet. Tweets. This does not go into your stream. People can click on your profile for Twitter. And click on the link to your favorites and see all the things you "favorite-ed." This may be something you want to try using. Lists: You can actually add people to the lists on Twitter and help you to categorize people. When you click on "the list" it will show just the stream for people on that list. If you want to follow a lot of people you may want to consider Twitter lists so that you can organize your stream. Hopefully, this will give you a good start on twitter and you can start posting. In our subsequent posts, we will cover more exciting topics about twitter, scheduling your tweets, using twitter with the SMS/text feature only etc. Keep tweeting and welcome to the Twittersphere!